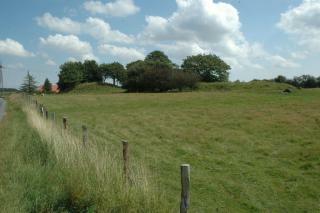 " Between Vedsted and Abkær Mose is a series of more than 100 burial mounds. Many of them, from the Neolithic period, are more than 5,000 years old. The vast long barrows are the oldest, and the longest is 115 metres. Each of them contains several chambers. Some occur in pairs, in parallel, like longhouses with a 'street' between them. At Holmehus is a large passage grave inside an earth mound, and a little to the South is a small dolmen chamber with a long entrance covered by a low mound; this type is known as a long dolmen. " When was the long dolmen excavated? The long dolmen was excavated in 1966-67, and produced hundreds of finds of fine flint tools and earthenware vessels deposited as grave goods. Why were they found in the forecourt? The forecourt in front of the entrance was used for a form of wake for the dead, and it is thought that the vessels were crushed as part of these Stone Age burial rituals. Generally, the mound appears to have been a sacred site. In its original form, it would have been a white mound, gleaming in the sun. Was the mound only used in the Stone Age? The dolmen chamber was used for repeated burials for 400 years, and 1,000 years later, people of the Bronze Age built another burial mound on top of this one, concealing what was even then a deteriorating white dolmen mound.